I am making this document request pursuant to the Freedom of Information Act and 16 CFR §1015. I would like to receive copies of all documents (written or electronic, including notes and staff briefing packages) relating to (a) interactions between Chairman Inez Tenenbaum and/or Commissioner Robert Adler and/or their staff and the House Committee on Energy and Commerce (and/or staff associated with that committee or its members) relating to the Consumer Product Safety Enhancement Act (CPSEA), and (b) any CPSC legal analyses or legal opinions relating to the CPSEA. Since the CPSEA is presently being circulated in draft form on Capitol Hill and since the committee’s staff is seeking feedback from various stakeholders at this time, time is of the essence for this information request. Please accord this request “fast track” status. My contact information is found below. Thank you for your cooperation. "It would appear that the 'governing principle' demonstrated by yesterday's passage of the health care bill applies here. There is little need for Democrats to try to build a consensus [on the Waxman Amendment]. They have control, so bipartisan support will only be achieved when those with opposing views capitulate or are outvoted. Brave New World, I feel so safe now. . . ."
I might be naive, I suppose. Who knows, it's not for me to judge. I was informed that this is how things work in Washington and the Golden Rule applies - he who has the gold rules. Nonetheless I think there's a larger point here. If you scroll back to the Halcyon days of 2008, you may recall the apparently urgent need to return to a "full" Commission of five CPSC Commissioners. It was asserted that somehow a Commission of three Commissioners just would not be adequate to meet the challenges of a modern world. At the time because of a vacancy, there were only two Commissioners (one Democrat and one Republican). Republican Nancy Nord, the then Acting Chairman, was savaged by Democrats for "gridlock" since the only possible explanation for the slow progress implementing the CPSIA must have been "foot dragging". Ah, how the passage of time gives us all new perspective . . . . Anyhow, with the smaller Commission, it was said that there wasn't enough dialogue, fresh perspectives, blah blah blah. The gridlock was all a hoax, as Nord and Moore voted together on all but one CPSIA decision in their tenure together. While the issues may have been fractious and they might have rarely shared the same outlook, they still managed to find a way to vote together. The problems, the "unintended consequences", were beyond the Commission's ability to resolve. It was Congress' fault, not theirs. Now with a full Commission of five Commissioners, three Democrat and two Republican, we find ourselves in a far more stratified and partisan situation where dialogue is often strained or nonexistent and voting blocks dominate decisions. Sadly, consensus building does not seem to be the modus operandi of this Commission or of this Chairman. With three certain votes, the Dems on the Commission hardly need to broker agreements or compromise to get to "yes". They control the Commission, and will do as they please. As Tenenbaum's and Adler's joint comments on the Waxman Amendment and the Tenenbaum/Adler/Moore joint comments on the Civil Penalty Factors indicate, the Dems are making no pretense about their controlling voting block. Pelosi and Waxman must love it. It is a shame that this partisan situation has arisen at the Commission. After all, the CPSC is supposed to be about safety, not politics. The division along party lines smacks of closed doors and minds already made up. Reasonable positions are being discounted by the Dems for political reasons, creating many losers but few winners. It is certain to produce lesser decisions. The upside of a full Commission is being squandered without the Chairman's commitment to seek consensus. Of course, there is far less need to open up or listen when control of the outcome is certain. Debate becomes a kind of charade mainly for public consumption. As has been apparent in the health care debate, frustration builds quickly when absolute power is used coercively. I heard someone on CNBC refer to the process leading to the passage of that bill as "dictating, not governing". This kind of resentment of the CPSC is also mounting as the "have not's" in the regulated community find themselves with fewer and fewer options. We did not sign up for a dictatorship. This is a sad reflection of the increasingly polarized world that followed Mr. Waxman into his Chairmanship of the House Committee on Energy and Commerce. He governs by "take it or leave it" as in his two CPSIA amendments. This is not the only way to get things done, however, as the Dingell era demonstrated. Naive? That's the reality that I see, unfortunately. Can any sensible person continue to deny the pain inflicted on resale and consignment shops by the CPSIA? The issues have been well-documented for almost two years now. Not only were these small businesses needlessly harmed by this law and forced out of the children's market, but the neediest American families dependent on these outlets were left in the lurch, too. Congressional Democrats left them there with the justification that it was for their own good. Spoken like someone with warm clothing on. "Janis Nelson, owner of Growing Kids consignment shop in Riverdale, points to a heavy book of lead-paint recalls as explanation for the store's decision to stop selling second-hand children's toys . . . . she could not risk a $25,000 fine, which is possible under the law if a single toy with lead were to slip past the heavy book of recalls." What a calming effect the CPSC has on this market! I can't wait to see what the CPSC's Small Business Ombudsman does to earn his wages. Perhaps he will roam the land assuring small businesses that by complying with the thousands of pages of rules under the CPSIA, they can avoid getting sued, fined or jailed. Crazy? Remember the words of Inez Tenenbaum: "'CPSC’s new authority to seek higher civil penalties does not mean we will ignore serious violations by small businesses,' said CPSC Chairman Inez Tenenbaum. 'We will continue to take enforcement action against any business, large or small, that violates the Commission’s product safety laws and regulations.'" And the market reality for the resale industry today? Ask the National Association of Resale & Thrift Stores: "NARTS members have reported significant increases in both sales and incoming inventory, according to NARTS, but those that sold children's products did not fare as well with 44.2 percent experiencing a decrease in sales due to the challenges of complying with the consumer act of 2008." It's time for Congress to stop sucking its thumb and do something for the neediest members of our society. Of course, some modest risk will be required to fix the mess they made in 2008. Resale shops deserve a bright line rule to encourage them back into the business of selling used children's products. The law's focus should be on recalled items only. The rest of the used children's product category should be saleable without risk of liability unless the store has actual knowledge of a hazard. The strictures of the CPSIA will slowly and effectively clear out old inventory over time. The resale industry has NO HISTORY of selling dangerous products or harming children. The "risk" of restoring the market sanity that prevailed before the lead mania of 2007/8 is trivial but the harm inflicted by the CPSIA fix is real and profound. It's time to 'fess up and fix the law, guys! The Product Safety Letter is gathering your opinions of the noxious Waxman Amendment in a survey closing on March 31. This is a great way to add your voice to the din over this dangerous piece of legislation. Remember, your entry is due by next Wednesday. Thanks! A little birdie dropped off what are purportedly the comments of Chairman Inez Tenenbaum and Commissioner Bob Adler on the Waxman Amendment. This is one interesting document. First of all, it's quite secret (but not anymore). You can't find it on the CPSC website. Other members of the CPSC community haven't seen it and have been refused a copy. It also doesn't have Tenenbaum's or Adler's name on it so it has appropriate deniability. Oddly, it speaks in sentence fragments. Hmmm. In an era of greater "transparency", this secrecy is something of a shock. Perhaps the Prince of Darkness is at work here. The comments recommend incorporation in the legislative report of the consumer group belief system assertion that there is no safe level of lead. If enacted, this change would enable, if not instruct, the Commission to reason from this "principle" and presumably ban many safe products. The hypocrisy of this position (or its obliviousness) in light of the permitted lead in our air, water and food is part and parcel of the CPSIA. The suggested report language clarifying the "no measurable adverse effect on public health and safety" will perpetuate the exemption morass confronting the Commission and regulated community. The comments state explicitly that anything that can be empirically measured will be impermissible, the exemption process will remain a hollow shell, a phantom provision. Why not just delete the exemption process and save everyone a lot of time, money and aggravation? Tenenbaum and Adler seem to miss the point that requiring a warning label for a product deemed safe is fatally inconsistent. Why warn for something determined to be safe in an exemption process? They ask for more discretion - to do what? What exactly is the risk here? The Commissioners note an openness to using a different term than "low volume manufacturer", such as "small batch manufacturer". This is apparently important to the HTA but seems to connote nothing of substance as both phrases are just terms or labels. I am stumped. The Commissioners basically go along with the definition of "low volume manufacturer". As if to dispel any notion that they favor relief for small business, they note simply that the $200,000 revenue limit should be restricted to manufacturing or importing revenue. The fact that this revenue level is both absurdly low and that the provision itself is designed to be useless to almost everyone did not garner comment from Tenenbaum and Adler. Their comment about the need to "assure" compliance by LVMs confirms my reading of the Waxman Amendment that it is NOT designed to change testing requirements on small companies - they must ALL "assure" compliance through a reasonable testing program. The "assurance" will require third party testing. Here is the comment offered by Tenenbaum and Adler: "At this time, CPSC staff believe that reasonable testing methodologies meeting this criterion could be developed for only a few of the CPSIA testing requirements and that third party testing will still be required in many instances. However, this provision could provide greater relief in the future as new technologies develop that the agency may be able to recognize as capable of ensuring compliance through reasonable testing methodologies." I guess LVMs can lump it . . . . The comments clarify that "imminently hazardous consumer products" incorporate the definition in Section 12 of the CPSA. Here is the definition from the CPSA: "[The] term ‘‘imminently hazardous consumer product’’ means a consumer product which presents imminent and unreasonable risk of death, serious illness, or severe personal injury." The comments simply remove any reference to "being made aware of" - perhaps to avoid the implication that the CPSC has to act before it has "identified" the risk, whatever that may mean. Remember, current law requires going to court - the new language merely requires that the agency "identify" the risk. That's quite a change - especially if you are on the receiving end. Think baby slings. The comments by Tenenbaum and Adler did not comment on the perils of the "technical" provisions in the Waxman Amendment previously documented in this space. As I have noted, Rumorville has it that some or all of these changes appeared on a mysterious and secret document sent by Tenenbaum to the Hill with her 20 requests for changes to the CPSA and CPSIA. This secret document has not been revealed yet. It is therefore no surprise that her comments would endorse the approach of the Waxman Amendment (as in the foregoing tweaks). Perhaps Rumorville is right that these changes were made at her request or with her consent. Consider the noxious changes to Section 6(b) of the CPSA - Tenenbaum and Adler apparently see nothing to comment on. Did you realize that the Waxman changes permit release of information based on a phone call? Say you make a Section 15 report, the CPSC does some interviews, creates internal documents, sends letters and emails back and forth to you - and a plaintiff's attorney calls for disclosure of these confidential exchanges and papers. The CPSC may simply ask how quickly the lawyer needs them. Did you also know that this release can be done without notice or even the knowledge of the parties affected by the information release? Did you know that the new language even permits the CPSC to release information it knows to be FALSE? Due process doesn't matter when you are protecting kids! Can you believe that Tenenbaum and Adler had no comments on this terrible provision? Or, how about the problems associated with damage to physical evidence subpoenaed by the CPSC which are also the subject of a civil suit? There is apparently substantial risk that this would be held against the defendant (you) under a principle called "spoliation of evidence". What might happen? If the evidence is damaged, "[the] finder of fact can review all evidence uncovered in as strong a light as possible against the spoliator and in favor of the opposing party." Ouch - that means you lose, big. To judge by their comments, it appears that Tenenbaum and Adler don't believe we deserve any procedural protections here. It would appear that the "governing principle" demonstrated by yesterday's passage of the health care bill applies here. There is little need for Democrats to try to build a consensus. They have control, so bipartisan support will only be achieved when those with opposing views capitulate or are outvoted. Brave New World, I feel so safe now. . . .
Anne Northup posted her letter to Henry Waxman re the pending amendment of the CPSIA. It is known that Inez Tenenbaum and Bob Adler presented their comments jointly but that letter has not been released and is not available yet. Commissioner Nancy Nord posted her letter to Henry Waxman providing comments on the Waxman Amendment in her blog. Her blogpost is entitled "One Step Forward and Two Steps Back. One forward, two back. I am quite concerned. Are you? How many pages do you think are necessary to define "Children's Product"? Okay, I bet you said 52 pages. That's cheating! Here is the CPSC's stab at the definition. No, I haven't read it yet. It's 1 AM and I have decided to take a little nap before the sun comes up. I will be back to you on this important document. In a meeting between various business representatives and the Waxmanis yesterday, the Dems set the parameters for moving forward on the Waxman Amendment. The Dems have established three "goals" for this amendment. The current draft reflects this "vision". A "bipartisan" bill supported by consumer groups, business and Democrats and Republicans alike. Do NOT open up the CPSIA for reconsideration. As I have previously noted, the Dems constrain the discussion by limiting what may and may not be discussed and then ask their "bipartisan partners" to make the best of it. This makes bipartisan support quite difficult to achieve because when the Dems present their draft, they indicate that all "compromises" have already been incorporated. This also allows the Dems to portray anyone who disagrees as an obstacle. Bring to mind anything . . . like health care? In this case, the Waxmanis are saying that the bill basically is where they want it to be, and offer that clarifications can be made in the report language to accompany the bill. [Something new to read, more traps for the unwary.] This strategy will lead inevitably to continuing arguements long into the future about things that used to be simple. This legislative strategy also means that many problems will need to be resolved by litigation - which is a VERY anti-small business approach to legislation. Can you afford to take a case clarifying safety law to the Supreme Court? We are all toast if this how our "community leaders" choose to govern. Let's think about the situation we find ourselves in. The first circulated draft, according to Waxman staffers, is basically FINAL but clarifications may be made in the report language behind the legislation. Hmmm. That sounds like "take it or leave it". Why would they take that approach? I doubt this is anything more than a political calculation. They put TWO terms in the bill that many companies really, really want and need, namely the modification of the phthalates ban and prospective application of the terrible 100 ppm lead standard. The message is clear - the rest of the bill, riddled with serious problems and provisions that gut existing CPSC practice and protections, would have to be tolerated to get that relief. It's pure Machiavellian politics. The "take it or leave it" approach is backed up with the implied threat that the bill will be rammed through the House Committee on Energy and Commerce on the back of the Dem majority. There is no commitment to a hearing, and besides, Mr. Waxman has a practice of staging hearings in order to control the message. The gutting of Section 6(b) and the rejiggering of voluntary recall disclosures is apparently not a reopening of the CPSIA in the view of the Dems. Why? Because they want to make those changes, spurred on by the Consumer Federation of America (Rachel Weintraub) and other consumer groups. Rumorville has it that senior Dem CPSC leaders are also pushing to completely revise these decades-old protections. Push back by the regulated community is being rebuffed, including requests for definitions of terms like "practicable" - why? Because it's not "appropriate" to put "numbers" into the law - they might change in the future. The other numbers already in the CPSIA apparently do not undercut this argument, according to the Dems. Business risk that stems from that kind of uncertainty is of no apparent interest to the Waxmanis. Makes you wonder how much they really want to help, doesn't it? Is this possibly a sham process to enable them to get a second bite at the apple? The terrible choice being forced on the business community is to accept some really bad provisions and terrible omissions in order to get two needed changes. The dominance of Waxman in this process has turned the children's product industry into beggars. What a great way to govern . . . . Under the imperious rule of Henry Waxman, you will get what he wants you to get. I hope you will remember this feeling for years to come. The treatment of the business community here is par for the course for this generation of Democrats. Remember, we are about to get the $1 trillion dollar health care bill WITHOUT A VOTE. They apparently interpret the 2008 national election results as a coronation and are acting accordingly. I think your views matter. Express them! The icing on the cake of the Waxman Amendment is their sneakiness. As if the problems already reported were not enough, the Dem authors greedily tossed in some real bombs, all using language sufficiently opaque to obscure their meaning. I presume this was some sort of "clever" gambit to escape attention. You deserve to know more. First, by way of background, let's review how we got to this point. The CPSIA was signed into law in August 2008 and howls of pain and protest began immediately. For more than a year, the Dems asserted that the law was perfect and the CPSC would fix the "unintended consequences". Over time, overwhelming evidence mounted to prove that the law needed to be changed, the CPSC could not fix everything without help and most disappointing, not all the bad consequences were 'unintended". After more than a year of bickering, Henry Waxman unilaterally tried to sneak a CPSIA amendment into an omnibus bill in December but failed. Finally, the CPSC Commission was ordered to submit a list of recommended CPSIA changes to the House Appropriations Committee on January 15. The Commission issued its report on time but could only come to consensus on a small handful of items. In the wake of the Commission report, this amendment was drafted by Waxman's staffers to "fix" the CPSIA. But . . . a couple other things happened. First, it is my understanding that Inez Tenenbaum sent a secret list of 20 changes she wanted to the Waxmanis. [I have not seen this document; its existence is an open secret.] So apparently, the Commission report was for public consumption, but the Chairman had her own wish list for private viewing. a. An Open Door to Confidential Information. Section 6(b) of the CPSA provides a notice period before disclosure of information to the public by the CPSC. Among other things, this provision requires that the Commission must give notice to the manufacturer of the disclosure to permit comment and dialogue, as well as the initiation of court actions (injunctions) to prevent the disclosure of such information (this is called "due process"). The Commission is also obligated to make sure "that such disclosure is fair in the circumstances and reasonably related to effectuating the purposes of this Act". This provision essentially provides a check-and-balance to prevent the unfair coopting of the information disclosure process against manufacturers. The amendment makes the following change to Section 6(b)(1): "striking 'its public disclosure' and inserting 'initiating the public disclosure'". Wow. I can tell you're reeling from the significance of this change. Okay, what's the big deal? Is there ANY difference here? Yes, in fact, there is. By changing these three words, Section 6(b) now applies ONLY to disclosures initiated by the Commission. Isn't that everything? No. What kind of information disclosures might NOT be initiated by the Commission? Freedom of Information Act requests by, say, reporters, plaintiff attorneys or consumer groups. The relationship between this provision and the Public Database is not clear. It might change (reduce) the flimsy protections already in place, or might provide a way for reporters, plainiff attorneys and consumer groups to get at information that might not appear in the database. This provision is entitled "CLARIFICATION OF LAW" in the Waxman Amendment. That is a plain, unambiguous LIE. The authors of this amendment think you are a fool. b. Subpoena Authority Loses Its Check-and-Balance. The amendment changes the rules on subpoenas in two important ways. First, in another "clarification of law", Section 27(b)(3) is amended "by striking 'documentary evidence' and inserting 'documentary and physical evidence'". This change does not incorporate any reasonableness standard and thus allows the CPSC to subpoena evidence in private suits regardless of the consequences, and even more importantly, can subpoena inventory as a backdoor way to recall it. This is unfettered government power. Is that a good idea? The second change requires a little background. The Commission has broad powers to delegate its powers to staff - except for subpoena power. So, if the CPSC wants to issue a subpoena, there is a procedural check-and-balance in place to require the additional step of seeking Commission approval. The Commission, being an entity visible to the public, presumably would be less wrapped up in the emotions of an investigation and be capable of more balanced judgments. It's a procedural safeguard that protects the integrity of the system but is highly unlikely to slow an investigation detrimentally. c. Information Disclosures in Voluntary Recalls Ratchets Up. The CPSC recently put out a 17 page Federal Register notice of its requirements for Mandatory Recall notices. Memorized it yet? Why not?! Of course, you may be forgiven for feeling you could ignore it, since mandatory recalls are quite rare and usually relate to severe risks to public health and safety. Most recalls are voluntary, which means mandatory provisions are rarely used. In any event, if it ever comes to this, the disclosure probably needs to be more comprehensive and significant. For those reasons, I did not comment on these rules. They seemed irrelevant to me. G-d forbid such a thing should happen on my watch. Pew-pew, knock wood. I may not have been the only one to look at it this way. Oops, my bad. The amendment makes these provisions apply to VOLUNTARY RECALLS. Sneak attack? Perhaps. The rules for mandatory recalls includes several obnoxious requirements, making compliance much more burdensome and expensive, not to mention potentially devastating to your business. d. If You Liked the Baby Slings Warning, You'll Just Love This Change. Knowing you as I do, I imagine you are thinking "I wish the CPSC could act more impetuously and strike out at entire product classes or industries without doing studies or anything too science-y." Well, it's really your lucky day! I believe that the CSPC must go to court to do this now. - What about due process? - What are the procedural safeguards? - When the CPSC jumps the gun and hurts companies or entire industries needlessly or in error, who will pay the damages? Do we get a bailout? Call me a cynic, but I think this erosion of safeguards is just a mite troubling. There are probably other ticking bombs in this legislation that I haven't found or told you about. I think you get the point nonetheless. 1. These four changes significantly erode protection of corporate interests under the CPSA. This makes doing business MUCH riskier and invites a lot of randomness into our business lives. It also makes it tough to believe you can trust the CPSC during a Section 15 investigation or other altercation. If you have a real worry about how you will be treated, do you experience a heightened incentive to cooperate or to hide? Will this raise the rate of disclosure of problems, or provide an incentive to bury the problems? If disclosure to the CPSC now involves certain pain, why would people bring misery on themselves voluntarily? And when more people start to hide - and are found and punished - will the cries for stricter rules rise or fall? They will rise, as howling consumer advocates will assert that this is "proof" of the venality of corporations. The "only" solution will be even stricter rules and higher penalties. Perhaps we should all be sent to jail preemptively, save some time. 2. I hope you share my utter outrage at the arrogance and effrontery of the duplicity and sneakery of the Waxmanis. Such arrogance is only possible when public officials feel that they are beyond reach. This deception shows clearly how high and mighty the Waxmanis feel, how imperious their attitude. Their anticipated ultimatum to the business community to fall in line behind this amendment is more of the same. It's rather revealing. There is no reason to puzzle over disillusionment with our government. The Dems blew it . . . and continue to blow it. This amendment was a chance to build bridges and mend fences. Insead, the Dems go on a rampage. I am tired of being treated like this by my own government. Labels: CPSC Leadership, CPSIA Amendments, Database, Enforcement Discretion, House Leaders, Legal Analysis, Recalls, Who Can You Trust? Two minor but important points in the new Waxman Amendment relate to the ban on phthalates and the 100 ppm lead standard looming in August 2011. Phthalates: The phthalates ban has been clarified to exclude "inaccessible" components, thus reducing the cost of testing for victims of this poorly-conceived law. The definition of "inaccessible" is based on foreseeable use and abuse by children. The term "reasonably foreseeable use and abuse" is defined, lest anyone misconstrue what the Waxmanis want it to mean, and hence new concepts have been incorporated: "breaking" as well as "the aging of the product". In the past, "reasonably foreseeable use and abuse" has been interpreted to exclude intentional misuse. The term did not typically include aging since most worn-out products are either handled differently or discarded. The changes wrought by this amendment fundamentally alter the common meaning of "reasonably foreseeable" in quirky ways, making a confusing law all the more difficult to understand or apply. If "reasonably foreseeable use and abuse" includes breaking the toy, it's hard to know which parts will ever be considered "inaccessible". Reading this language by its plain English meaning, I cannot imagine what might survive this legislative test. Worthless. I sense another rulemaking process for the long-suffering CPSC. The amendment also clarifies that the CPSC can revoke this exception to protect the public health and safety. Remember, we are talking about a rule affecting mandatory testing of internal components that may or may not contain phthalates. Can anyone tell me what threats to the public health and safety could POSSIBLY result from an internal component made with phthalates? Phthalates have been in use in this country for more than 50 years - wouldn't we know about "leaping phthalates" by now? Oh yeah, I'm sorry, i forgot that reasoning and science don't matter anymore. . . .
Perhaps concerned that the CPSC was running out of things to do, the authors added yet another rulemaking on "inaccessibility" for this new exception. They are free to adopt the definition already set for lead. It's up to them. Study up, guys! Can't wait to give comments . . . .
Can you say . . . mania? It is worth noting that in taking this route to "resolve" the pain points on phthalates, the Dems have chosen to NOT address a pending issue between the CPSC and California. Attorney General Jerry Brown of California sent a hot letter to the CPSC last year indicating his unwillingness to accept testing of the entire product for phthalates ban purposes. In the wake of his letter, the agency reversed course and rescinded its rule permitting a single test on the entire product. This would have been inexpensive for manufacturers. It is pure fantasy that the Dems would take on Jerry Brown since our Congressional overlords are largely from CA (Waxman, Pelosi, Boxer, Feinstein) and are busy trying to California-ize the rest of the country. Henry Waxman would certainly never preempt Jerry Brown for the national good. Hence the half-a-loaf approach here. Lead: The Waxman Amendment makes the pending 100 ppm lead standard prospective. This is a tiny bone thrown in our direction. You may consider it a nod of acknowledgement of your pain from the retroactive application of the lead standards and phthalates ban. Nonetheless, this is all you will get. Again, this is only half-a-loaf. A more thoughtful and helpful change would have been to draw a FIRM LINE under the 300 ppm standard, eliminating the 100 ppm standard altogether as well as the rule ratcheting down the lead standard in the future (forgot about that one, right?). They could have said that the CPSC would be free to lower the lead standard in the future if necessary to protect public health and safety (taking into account the cost and benefit of any such new rules). But they didn't. The Waxmanis have no interest in such concessions. Whether out of zealotry or pride of authorship, no amendments will emerge if they reflect any concession of error or misjudgment in the Perfect Legislative Process. Thus, the 100 ppm standard can't be removed because they put it there for a reason. We must live with it . . . so they say. Rumorville has it that the Waxmanis are about to deliver a message to leaders of the business community to fall in line behind this "wonderful" amendment or else . . . they'll get NOTHING. Don't you love this? And I used to think THEY worked for US. What an idiot I am! And on that note, I encourage you to read ONE more blogpost about this toxic amendment. I still need to show you how the authors are trying to deceive you and gut the system that regulates safety of safeguards against governmental abuse. That is, abuse of the interests of your businesses. It's really something to see. The proposed Waxman Amendment adds a new term to our CPSIA lexicon: "Low Volume Manufacturers" (LVMs). This term is introduced in the ironically-named Section 4: "RELIEF FOR SMALL MANUFACTURERS AND OTHER BUSINESSES". "(A) manufactured or imported no more than 2,000 units of all products manufactured by the manufacturer during the most recent calendar year; and (B) had gross receipts totaling not more than $200,000 during such year." "the products and gross receipts of a manufacturer shall be considered to include all products and gross receipts of each entity that controls, is controlled by, or is under common control with such manufacturer." Yep, THAT'S small alright. In other words, if you made or imported 2000+ units of anything regardless of value (all products added together) OR had gross receipts of $200,001 last year, you get nothing here. So, if you sold 3,000 Popsicle sticks for $50, you are out. If you sold 201 cabinets for $1,000 each, you are out. Only the true small fry are included here. Happy? Hey, isn't there some sort of federal definition of a "Small Business"? Yessir, the SBA publishes size standards to define Small Business. These federal standards are found in myriad federal legislation (shocking, right?). They are widely used - so why not include them here? That question was posed directly to the Dems - especially since earlier drafts of this amendment featured a higher dollar limit (also inadequate). Why did the Dems tighten the standard so much? Why not incorporate the SBA standards, like every other federal agency? The best explanation I can give is that the Dems don't really have any interest in providing relief to small businesses. They also may want to appear to give relief, principally to fool members of Congress who have expressed concern for the fate of crafters under the CPSIA. Do you think I'm being too cynical? Let's not forget the words of Senator Durbin's associate a year ago: "I think you are right that the CPSIA imposes costs on businesses, and because of economies of scale it’s the smaller businesses that will feel these costs more acutely. This is part of a larger calculation that it’s worth the costs to shift from the old system of post-market correction (once a dangerous product is out in the market and leads to sick kids, recalls, lawsuits, etc.) to a new system of pre-market testing and certification (instead of just assuming products are safe and paying the price for false assumptions)." She said it - small business problems induced by the CPSIA were part of a "larger calculation". With this amendment, the Dems again test our gullibility. a. This provision is designed to provide modified requirements for LVMs under Section 14(d) of the CPSA, in other words, the long-delayed and never drafted "15 Month Rule". For those of you scoring at home, the "15 Month Rule" is now four months late - call it the "19 Month (and counting) Rule". b. The "relief" that the CPSC can offer LVMs is "alternative testing requirements" that "provide for reasonable testing methodologies to assure certification based on compliance with the relevant consumer product safety standards". The alternative methods must ASSURE COMPLIANCE. Can you picture what such "assured compliance" might look like? If these words have their normal English language meaning, the "relief" should be nil if compliance must be assured. c. The CPSC has the right to implement such alternative testing requirements for LVMs on a product, product class or even for a specific safety standard or part of a standard. d. NO relief is allowed for lead-in-paint, cribs, pacifiers, small parts, children's metal jewelry, baby bouncers, walkers and jumpers and durable infant or toddler products (as defined somewhere). All of you LVMs, make a note! Have you ever heard the expression "trap for the unwary"? e. This provision also calls for the creation of an "Office for Business Education, Outreach, and Advocacy". Since I called for such education resources in my first speech at the CPSC back in November 2008, I shouldn't make fun of this. I just like the legislative goal of this organization: "assist the Commission in informing and educating manufacturers and retailers about requirements under this Act or any other Act enforced by the Commission". This is much needed. Of course, given that you must master literally thousands of pages of gobbledygook to fully understand the CPSIA as implemented, I would DEFINITELY not want this job. If anyone calls about this opening, tell them I am at the dentist. Shame that you and I won't be eligible for tracking labels relief, too . . . . This charade purports to provide relief to small businesses but in fact, will benefit virtually no one. Even the Handmade Toy Alliance, a CPSIA advocacy group created by crafters, has few members that would benefit. Notably, there are many more small businesses affected by this law beyond the HTA, so the failure to impact HTA members is just an indicator of how lame the proposed relief actually is. The SBA sets a high bar in its definition of small business for several reasons (as high as 500 employees or $500 million in revenue). Among them is a fear that legal benefits for small businesses may be unfairly distributed if the definition is too narrow. Many small businesses could miss out on needed protections. Furthermore, the complexity of the U.S. economy makes it difficult to describe a small business. The high bar in the SBA definition leaves room for small businesses in every industry from airplanes to pencils to baby clothing. The SBA certainly doesn't want to disincentivize growth or prosperity among small businesses. They recognize that the small business community is a huge jobs creator, so maintaining its financial health is a public policy imperative. The SBA wouldn't want small businesses to lose special legal benefits because of an immaterial event, like a small incremental sale. So a law that TAKES EVERYTHING AWAY when you sell one more unit of ANYTHING or take in one incremental revenue dollar (all at a very low level of sales that would not coincide with a fundamental change in the nature of your business) would never fly. Never fly with the SBA, that is. Mr. Waxman apparently thinks this is fine - but actually, it's UN-AMERICAN. Our laws are supposed to encourage us to grow. At least they used to. If there is one basic reason to be critical of this provision, it's the very conceit of granting relief by business size. This misses the point of SAFETY entirely. Size of business only became an issue under the CPSIA because the law is too broad. Let's not forget that the prior law had standards for products, not for companies by size. Why do we need size exceptions now? Think about it - if your child is harmed by a product, will it matter how much revenue the manufacturer earned in the previous year? Do you think the CPSC wants to modify "safety rules" for little businesses only to find out that one of these businesses hurt your kid? Uh, no. So why take this legislative approach? It's simple -the Dems have constrained the way we can fix the law. They have fixed, absolutely FIXED, the definition of "safety". The original standards and the original age limits MAY NOT BE REVISITED. These rules are too broad and invite many negative consequences - but since the Dems will not agree to modify them, we must apparently devise ever more complex rules to circumvent (or apparently circumvent) the problems they cause. In this case, the Dems offer relief for tiny companies. Those of us who have enjoyed enough success to hire a few employees and stop working out of our bedrooms are ineligible for this "relief" although our problems are just as troubling. I do not accept that there is no solution here, however any durable solution requires that the definition of safety be modified to something sensible. The Dems won't allow it. This is their "legacy" and they are bound and determined to ensure that it survives, ridiculous or not. That's your small business relief. Enjoy! I intend to publish one more post analyzing the rest of the Waxman Amendment. It will cover an exception to the phthalates ban for inaccessible components. It will also document the sneakiness of the remaining language in the amendment. You aren't meant to understand it - but I will do my best to shed some light. Sorry, Henry! Let the sun shine in. The new Waxman Amendment provides an arcane and inadequate resolution of the longstanding complaints about the treatment of resale shops and resale goods under the CPSIA. The amendment adds a new provision, Section 101(b)(3), to address the resale issues. a. It only applies to lead restrictions. The exceptions for resale goods do NOT apply to the phthalates ban. This means that used toys are unlikely to reappear in resale shops. It also means that anything possibly affected by the phthalates ban, including certain clothing and childcare articles, will be dangerous to sell in resale shops. The legal niceties are of little import here - these low revenue stores won't go near trouble. Will they know what's okay to sell and what's not? Probably not. Of course, the CPSC could always put out a new guidance brochure for them - something to look forward to! "The term ‘used children’s product’ means a children’s product that was obtained by the seller for use and not for the purpose of resale or was obtained by the seller from a person who obtained such children’s product for use and not for the purpose of resale." This obtuse language is intended to forbid the bulk resale of merchandise by inventory liquidators while permitting charity or consignment sales of children's product. "For profit" resale shops will also be snagged on this language. The origins of this language is presumably Commissioner Bob Adler's odd Solomonic recommendation that charity shops be allowed to sell used clothing but not "for profit" resale shops. The new definition is confusing because of the peculiar word "obtain". There is no question that under this provision, you cannot "obtain" children's products for the purpose of resale. Does this restriction apply to donated goods? Probably not because the legislators presumably believe you don't "obtain" a donation for a particular purpose. Of course, that's a fiction - do you think the Salvation Army accepts donations of children's products with no purpose in mind? Could this language be a backhanded way to approve the distribution of donated goods for free but not for a nominal price? Possibly. Would this limitation apply to consignment sellers who never take title - do they actually "obtain" the goods? Consignment sales may be okay but no doubt some factual inquiry will be required, a nice case-by-case analytical process to keep the CPSC busy! Ebay resellers and "for profit" resale shops are almost certainly not given relief by this language. The Resale Roundup is not in danger . . . . The asserted distinction between a reseller of donated goods (a so-called charity shop), a consignment store and a "for profit" resale shop is flimsy and patronizing, in my view, reflecting a patrician view of society and the needs of the "lower class". As I have explained in the past, the issue should be about safety, not compassion for the impoverished. Is it morally permissible to give dangerous products to children because they are poor? Please, don't insult my intelligence. If the goods are safe, sell them - and if they're not, throw them away. It has nothing to do with "needy" kids. This is yet another case of Dem legislators being unwilling to take a reasonable stand on what is and what is NOT safe. They are apparently willing to sacrifice the resale industry to their lack of courage. c. As if the foregoing didn't prove that the bill's authors live in La La Land, the definition of "used children's product" has several exceptions, namely children's metal jewelry, painted children's toys, children's products comprised "primarily" of vinyl and any other children's product later identified for this list by the Commission. I guess the charity shops are supposed to keep their eyes peeled. So apparently the idea is that resale shops can get back into the children's product business except . . . except . . . except . . . . The simple relief these shops need has been denied in favor of new uber complexity. To the intended beneficiaries of this "relief", complexity alone will make the law unintelligible or at least unmanageable. Despite the "good intentions", the effect of the relief will be moot - in other words, nada. You should be OUTRAGED about this situation. The very FACT that this Dem-controlled Congress has been sucking its thumb over this issue for TWO YEARS, through two cold and snowy winters, is a national embarrassment. Frankly, it more shameful than that. When the Dems finally worked themselves into action, this is the best they could do? The persistent inability of the Dem Congress to act sensibly on this issue is both demoralizing and illuminating. This situation is the Dems' handiwork and yet, the disruption of this market affects the neediest Americans, and among them, the youngest and most vulnerable. Quite a departure from Democratic Party traditions. Not only is access to kids' warm winter clothing impacted, but so many other important products are embargoed, from baby items to educational products to whathaveyou. And even though the needed goods are plentiful, the CPSIA made it prohibitive to offer them for sale at a low price. Too bad, Poor People! The poor don't deserve to live in the anti-economy just because the Dems have a phobia. The fact that the Dems can't apparently empathize with people who really need their support is so shocking. I hope you won't support this bill regardless of its impact on you unless it gives real relief to those in need. If we are really a community, we must DEMAND true relief for the resale market. It's time to take a stand against a stubborn, morally-numb, self-justifying Dem Congress. On Friday, House Democrats began to circulate a discussion draft of a new amendment to the CPSIA. This draft follows the abortive effort by Chairman Henry Waxman of the House Committee on Energy and Commerce to slip a CPSIA amendment to his own liking into omnibus legislation last December. [That effort was disclosed and discussed in this space from December 11-16, 2009.] The crash-and-burn of the first Waxman amendment created a new dynamic in CPSIA negotiations as it was the first (tacit) public acknowledgement by Waxman that the law was flawed AND that the CPSC could not fix it by itself. The failure of the secret amendment effort also showed that Mr. Waxman isn't invincible. So, a step in the right direction. Recently, in the wake of the January 15th recommendations of the CPSC Commission, the Dems reignited the simmering discussion of CPSIA changes by engaging various stakeholders on how the first Waxman amendment could be improved. This process was constrained by the Dems' insistence that comments be in the form of changes to the first Waxman amendment, thereby eliminating anything too "blue sky". Consistent with the recent (and short-lived) post-Massachusetts Dem preference for bipartisan "cooperation", the Dems actually asked House Republicans what they thought. Let's just say the Republicans see some basic flaws in the law. . . . Anyhow, the Republicans having provided their feedback, largely rebuffed, this draft emerged. The procedural process forward is unclear. The standard (and appropriate) process would be a hearing followed by a "mark-up". The Senate also has something to say on this legislation (their position is not clear although Senate Dems more readily acknowledge the need to fix the law). It remains to be seen whether Waxman will allow a real hearing on the CPSIA to take place. Dissenting views are not well-tolerated in this era of Congress. Anyhow, the Dems are asking stakeholders to send comments by this Friday. I intend to discuss this proposed legislation in several essays. In this essay, I would like to discuss global issues. I will return to discuss the specifics of the law, notably the treatment of Section 101(b), in later posts. a. The amendment dodges most of the serious issues in the law. My list of changes is comprehensive, and the draft legislation avoids most of it. This amendment makes no effort to respond broadly to the well-documented flaws in the law. No one can argue anymore that the CPSC can fix these problems. The legislation reads (to me) like the position of someone almost completely in denial. Let's face FACTS - the CPSIA was passed on August 14, 2008. It is now March 14, 2010. That's a long time. The CPSC has blown countless deadlines, and has failed to resolve MANY critical issues so far, like the phthalates test standard, the 15 month rule and so on. They are working around the clock. This thing is not going to fix itself, and the agency's future is literally at stake. The Dems refusal to face up to these issues is a betrayal of you, your customers and your marketplace. b. You might ask - WHY are the Dems avoiding all of these serious issues? Are they deaf? I think the answer is that they are hardly deaf but have little interest in opposing viewpoints. The CPSIA is their legacy and as such, no amendment will be blessed by them if it admits a defect in their original thinking or their asserted Perfect Legislative Process. An "acceptable" amendment must therefore pay homage to the original law and its structure. By working within the law's original structure, the Dems ensure that the basic defects will survive amendment - and the consequences to your business, your market and to the regulators themselves will remain devastating. The proposed rules on the so-called "functional purpose" exception also kowtows to the law's concept that everyone must ask for permission to be excused from lead requirements. In other words, the Dems reject the notion that the law can be narrowed rationally and appropriately without a burdensome bureaucratic process. Even action by the agency on its own initiative will be a major ordeal. The Dems know (because they have been told) that the exception process is effectively a closed door for all but the most well-capitalized companies. You may interpret the legislative language as the Dems' response to this small business issue. Another good example of the Dems' sticking with the original law's structure is the use of the word "practicable" in the Section 101(b) changes. This change is the doorway for the ATV'rs and book publishers to argue for exceptions to the lead-in-substrate standards. I am told that this word was chosen because of a Supreme Court decision (that I have not read) holding that "practicable" incorporates concepts of economics. Ah, I see. In other words, this language is a way to make the law look just like the original one, but still provide a faint hope for business people that they can somehow wriggle out of ridiculous lead-in-substrate restrictions. It's obscure, to say the least, but leaves the original legislative structure in place - the Dems' principal goal. c. The new amendment ADDS more complexity to an already blindingly complex law. I have written about complexity numerous times, and recently posted a video explaining the frustrating challenge of trying to understand this law fully. Complexity in this case does not reflect the difficulty in creating a safe market for children's products. Actually, that issue is long-resolved. The complexity stems entirely from a defective legal structure and its consequences. If the Dems insist on keeping the original CPSIA structure in place, you must get used to complexity spawning more complexity in your business life. It will only get worse. This is what Big Government looks like. Hope you like it. Risk Assessment by the CPSC and/or the Commission. Changes in age limits for the lead standards and phthalates ban. Narrowing of the scope of "Children's Product" to eliminate many categories of products unthinkingly pulled into this law by its overly broad language. True reform to protect small businesses. And so on. As noted above, to take these steps would mean acknowledging that the original law was grossly defective. The Dems would rather eat lead-free glass than admit their career achievement was fundamentally defective. Ironically, the Republicans have no such reluctance, despite voting for the original law. The sad prospect is that unless the Dems have a change of outlook (soon), real reform may need to wait for a change in gavel (bye, bye, Mr. Waxman). Hence my excitement over the prospect of voting in November. The House Democrats just released the first publicly available draft of their proposed corrective amendment to the CPSIA. The draft may be viewed at this link. The next step in the legislative process will be either a hearing or a "mark-up", neither of which has been scheduled. While the Dems had originally offered to follow the usual procedure for such important legislation, namely a public hearing followed by negotiation of the language (the "mark-up"), of late this idea has seemingly drifted away. Let's hope it resurfaces. At this time, the Dems have requested comments on this draft from various interested parties by next Friday. Please NOTE that this draft is a result of recent backroom negotiation, such as it is with Mr. Waxman, and thus reflects the Dems' view of "middle ground". The "bipartisan" nature of the drafting process leaves something to be desired, as Mr. Waxman and his team have insisted that the bill be based on his failed unilateral CPSIA amendment of last December, and have resisted the larger changes necessary to restore rationality to the law. While some issues are addressed by this draft, other problems move backwards or are simply ignored or buried. As you might imagine, this has not pleased everyone. Time will tell whether the Dems will continue to exhibit selective hearing as the process moves forward. For now, enjoy reading the latest. I will provide analysis in due course, and in any event, look forward to your comments. What are the warning signs that you are about to be "Daiso'ed"? Of course, I refer to the CPSIA penalty recently inflicted on Daiso, a Japanese dollar store chain, in relation to five recalls (of 698 units spread over 19 items in a two-year period) and some inventory stopped at U.S. ports. The Daiso penalty, in case you missed it, was a mere $2.05 million in small bills, about 10% less than Mattel suffered for inciting the CPSIA and nearly double the penalty inflicted on RC2 who also gave a helping hand to bringing the CPSIA to life. OMG, this could happen to you and me, too! How can we tell if we have wandered into such treacherous waters? 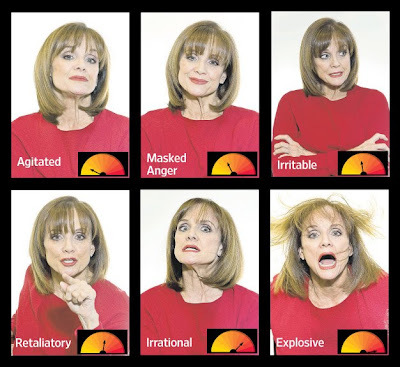 I suggest that you use this handy chart denoting the stages of anger at the CPSC. Of particular concern are "Masked Anger" and "Retaliatory". If they ever get to "Explosive", it's time to mortgage the house. I think a garage sale might just inflame things further . . . .
Cassandra here . . . .
Let me try you out on a hypothetical. What would you recommend as "consequences" for the following fact pattern? A company exhibits a pattern of safety incompetence over a period of time. Owing to agency vigilance, they are told multiple times to shape up, which they never get around to doing. No one is injured, but several minor recalls result. As we live in a time of political correctness and hyper-concern over trivial matters, the recalls not surprisingly involve only a few units of numerous products (less than 1000 units over two years). No injuries are reported. Numerous letters go back and forth, and theoretically, some of the culprit's safety violations could have resulted in injuries. So what penalty do you hit them with to get your message across? For perspective, Mattel paid a fine of $2.3 million for about 2 million units recalled. This was national headline news. Mattel also recalled many millions more in other recalls in the same time period. RC2 paid $1.25 million for their recalls of 1.7 million units of Thomas the Tank Engine, a series of recalls that included an embarrassing recall of "thank you" gifts sent to people returning lead-laden Thomases. Target paid $600,000 for its "sins" in three relatively large scale recalls (545,500 total units). And I fully agree, respect and attentiveness to the details of the law are mandatory. Everybody needs to take these issues seriously. And the answer is . . . . Try $2.05 million. Cash. You wonder why I say that the CPSC leadership has blood lust . . . .
Oh yeah, I forgot, the CPSC also sicced the U.S. Attorney on 'em, hitting the company with an injunction, a cease importation order and a mandatory plan of remediation. Total over two years: five recalls, 698 units, 19 skus. I have no personal knowledge of these people or this case. I also agree that the facts suggest that this company was recalcitrant or possibly incompetent. In any event, it's their responsibility to take our laws seriously. Nevertheless the CPSC press release and the injunction both portray a far more serious situation than the facts seem to demonstrate. This is hardly a case of ingested super-magnets and millions of units in circulation. And the penalty, of course, is so far beyond the pale that I consider it incomprehensible. It is also extremely worrisome. Today's CPSC is about sound bites and putting you "on notice". Whether their tactics are fair or appropriate seem to be a secondary concern. Note this quote from Japan Today: "'This landmark agreement for an injunction sets a precedent for any firm attempting to distribute hazardous products to our nation’s children,' commission Chairwoman Inez Tenenbaum said. 'We are committed to the safety of children’s products, and we will use the full force of our enforcement powers to prevent the sale of harmful products.' . . . CPSC spokesman Scott Wolfson said the company had been warned several times about violating safety standards." In other words, this is entirely justified because the company had been warned and laws had been broken. I see. There is a concept in Anglo-American jurisprudence of a punishment to fit the crime. I wish the CPSC knew something about proportionality in administering justice. Unfortunately, this CPSC seems to think that the importance of public messaging allows them to justify whatever they want to do. There seems to be no constraints, whatsoever. As Mr. Wolfson intones, after all, Daiso had been warned several times. Ergo, it's fair to whack them with a penalty almost as great as imposed on Mattel. For less than 1,000 units sold. Have you ever sold less than 1,000 units of something? Has anything ever gone wrong in your business? Uh-oh. Start saving up! If you are having trouble grasping the point, consider the recent case of the man caught stealing a $3.99 bag of cheese in California. The judge went easy on him, only sentencing him to 7.7 years in jail. Nothing wrong with that, right? As the defendant's lawyer noted in her closing remarks, "She concluded that his most recent thefts were petty. 'We’re talking about a pack of cheese,' she said." Good thing the judge was listening . . . . This kind of justice brings to mind Midnight Express, the nightmarish story about Turkish jails. We're not that kind of country, right? Right??? But in this environment, with the pack of jackal consumer groups egging them on, this CPSC is prepared to lower the boom to squish anyone who dares be incompetent. Here's Consumer Reports on the case: "Our take: This is more evidence that the CPSC has been reinvigorated and that the new leadership at the Commission, plus the new powers under the CPSIA, mean good things for consumers." In other words, it's not only okay, it's a sign of returning "health" in our U.S. government. Yippee. I agree some sort of penalty may be merited in a case involving a pattern of violations. A large company like this one might need a large-ish penalty to "get the message". [I wonder about that. Is it certain that this company would not have changed its behavior for a penalty of $50,000 or $150,000? The CPSC never tried smaller penalties first, as escalation seems to not be part of their vocabulary.] Nevertheless, this penalty lacks any rational relationship to the trivial problems cited in the recalls. In other words, it is completely arbitrary. And for those of us destined to have to deal with the CPSC on resolving problems in the future, the Daiso case in your warning. Under this Commission, the agency has no apparent intention or need to be reasonable. They are unfettered in their ability to punish and exhibit no self-restraint. You won't be able to fight them, they print their own money. It must be nice to be both judge and jury. This is what our country has turned into. I CAN'T WAIT TO VOTE AGAIN. November can't come fast enough for me.